We’ve long passed the day when ‘Film noirs’ were considered the pinnacle of moviemaking but even up until now, there are moviemakers and game developers that tickle a certain interest when it comes to creating their movie or game. A Crowd of Monsters inspired itself on these classic cinematic experiences and molded it into a current day detective story with a very grim and gruesome plot. Dive into the darkness in an episodic game that situates itself around characters that actually existed, albeit modified to make them right at home in this bloody epos. Some of you may have heard about the ‘Untouchables’ which were police officers in the 30’s, who were responsible for the prohibition of alcohol, simply to mess with Al Capone, the top gangster of the time, who they simply could not get convicted due to lack of evidence. A Crowd of Monsters puts these characters in their natural habitat, while building a horror fiction story all around it. Eliot Ness has retired and has opened a diner, in order to sit back and enjoy a more tranquil life, at least until Milton walks into his new place of work. Milton places a bullet on top of his counter, and while the man acts mysterious, Eliot immediately knows it’s a sign that Capone is back, even though nearly twenty years have passed since he disappeared behind bars. Nonetheless, Eliot is curious to see what this invitation will have in store for him, and he decides to follow Milton, who leads him all the way to the Hindenberg monument. Little do people know, the actual replica of the Hindenberg, which hangs in the sky, is actually a hotel for rich people, who have something to hide. Al Capone is the top honcho on this ‘flying’ hotel, but it seems Eliot was not invited as an enemy, but as someone who can help the gangster. Eliot hates Capone with all his guts, seeing he killed his partners, who were also part of the Untouchables, and Eliot once even barged into his place planning to shoot him in the face. Luckily for Capone, the gangster’s son walked in and made Eliot change his mind. After a rather salty conversation, Capone asks Eliot to help him with a case and while reluctant at first, Eliot agrees, seeing it’s not Capone’s life that is in danger, but his granddaughter’s. It seems the mobster’s granddaughter has been abducted, and there’s no proper trace of her. Eliot will once again have to find missing children, like he did almost twenty years ago, when he was still on the force. Sadly, the latter didn’t turn out well, as the case consumed him wholly and he never booked any results. During this entire ordeal you’ll be presented with snippets of Eliot’s past, when Capone was still at large or even small scenes where you’ll be seeing Sofia Capone, Al’s granddaughter. The latter proves to be a lot more grim, as it seems she is becoming part of an occult ritual, which involves more children, who are getting butchered, locked up and so on. During these first two episodes the information on what is happening with Sofia is rather slim, but it does add a lot of suspense to the story. Throughout the entire story, the game will present you with choices, which will actually have an impact on the story and how certain characters respond. Of course, it’s clear that certain events will always occur, one way or another, but actions taken in Episode 1 are remembered in Episode 2, which gives you the feeling that your choices truly matter. Blues and Bullets, as mentioned before, loans a lot of inspiration from older Film noirs, which makes the game rather dark, which in turn perfectly suits the story. 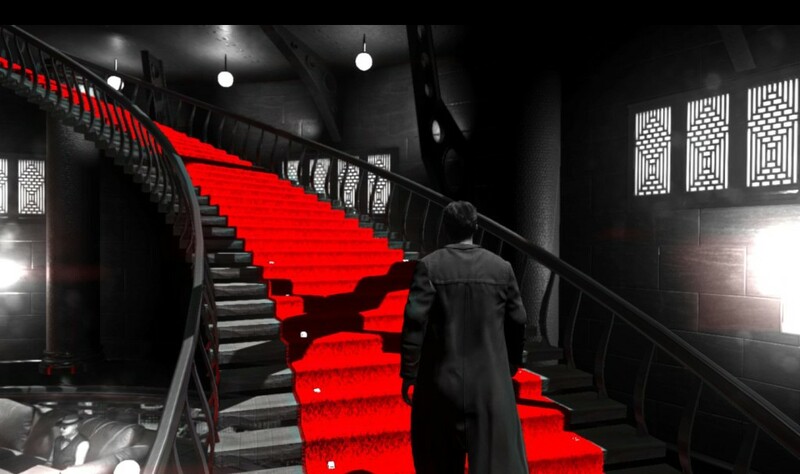 This means you’ll be plowing through the game in black and white, only with the color red intact to highlight blood, and certain other more friendly items in the game, such as cars, traffic lights and garments. The usage of light is also rather important when setting the mood, as it creates a certain contrast with the darkness that is constantly surrounding you. Even though how the characters and their movements are rendered is not something on par with games that have a gigantic budget, things look appealing and have a certain air of realism surrounding them, even on the rather crazy, and futuristic looking locations you’ll visit. 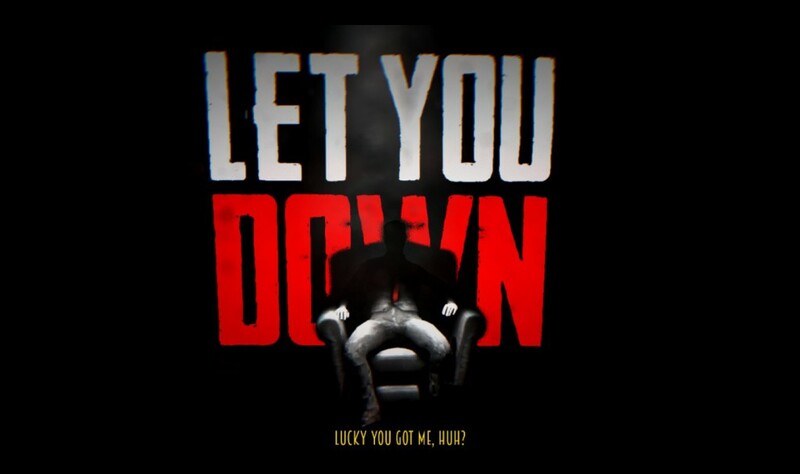 You’ll have an old school vibe from start to finish, that perfectly suits the time period in which Al Capone was still relevant. While the game runs rather smoothly in the first episode, the second one suffers from occasional frame drops, which are in itself not that bothersome, but episode 2 lacks the fluency the first part of the game presented you with. Other minor issues are the fact that you often run around without a shadow (Peter Pan must have become a disgruntled detective when he grew up) and the fact that you tend to glide over the floors and staircases. While the latter is something many games still suffer from, it’s sometimes very noticeable. As the game relies heavily on mood setting, it’s only natural that the soundtrack has an eerie undertone to accompany the rather gruesome tale that is slowly unfolding. Not only adds the music to the overall atmosphere of the game, there are some reoccurring tunes that mark certain events, which add a certain affinity for the music. Voice acting is another key component of Blues and Bullets, as the game is story driven, it certainly helps if the narrative is portrayed properly. As you’ll mostly be limited to the confines of Eliot’s mind, he’ll do a lot of the background storytelling, when you’re out looking for clues. Other than that, you’ll be treated to your fair share of dialogues, which are all performed in a very qualitative way. 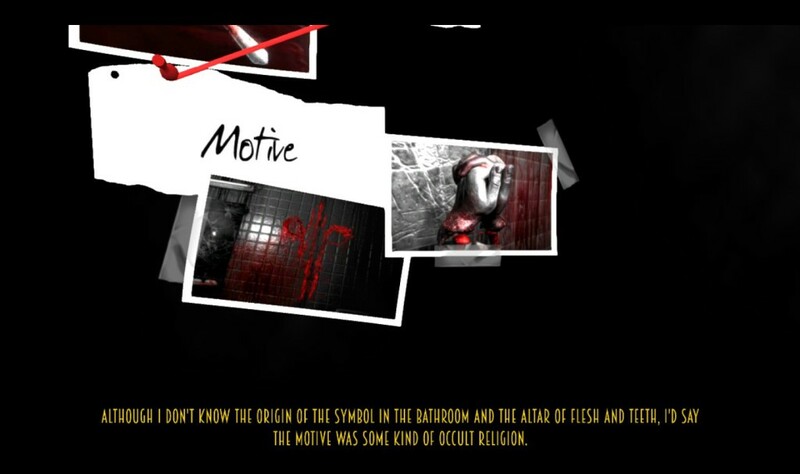 Blues and Bullets is a story driven detective/puzzle game, with a low amount of combat sequences thrown into the mix. This means you’ll be spending your time exploring the vicinity, all while solving puzzles and interacting with whatever is thrown in front of you. In reality, this game is pretty much a third-person point-and-click game, with a few arcade shooting scenes added to spice things up. During most of the game, you’ll be waddling around with Eliot, looking at objects, which makes you hear his thoughts or memories on the matter. While many of these interactions will lead to nowhere and just add some story value to the equation, during investigation sequences you’ll have to snoop around properly, in order to find all the clues to solve the puzzle at hand. During your investigation, you’ll have to put certain clues together, which unlock a new part of the problem, which you’ll have to solve by putting other clues together, and so on until the entire puzzle is placed together, which will allow you to progress. While many items are often completely explained and viewed by one button, there are those you’ll have to examine properly and thus twist and turn (with your right stick) before registering all the peculiar feats of said item, which will in turn unlock a clue. Overall the mechanics of all of this are extremely simple, and you won’t have to overexert yourself in order to put everything together. 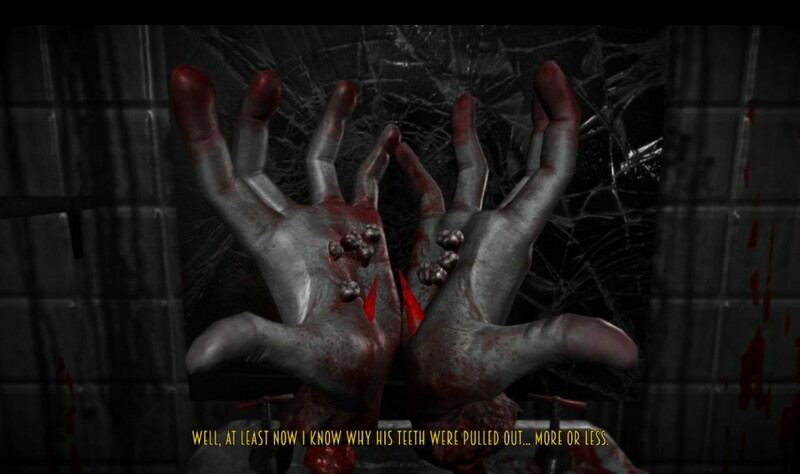 The game will even point out you aren’t putting the right clues together and will allow you to retry until you do, making sure the player will be able to enjoy the story without suffering from too much frustration. Combat scenes are presented in two different fashions in this game, namely by the use of quick time events and an on-rail shooter, which grants you little to no freedom. During fist fights, you’ll simply have to respond in time to press the button signaled onscreen, and you’re good to go. The arcade shooting parts of the game are simple, satisfying but do lack a certain sense of variety. During these segments you’ll find yourself hiding behind a cover, all while adjusting your aim to make sure you’ll be pointing your gun at the bad guys when you pop out of your cover and deliver a rather liberating kill shot. Sadly you can’t move around, except switch covers by the press of a button, and thus you can’t really use different tactics to dispose of your enemies. These segments are pretty much the equivalent of a dumbed down version of Time Crisis, without its explosive flair. That being said, these action segments of the game are rather welcome, as they provide a nice change of pace from your investigatory adventure. 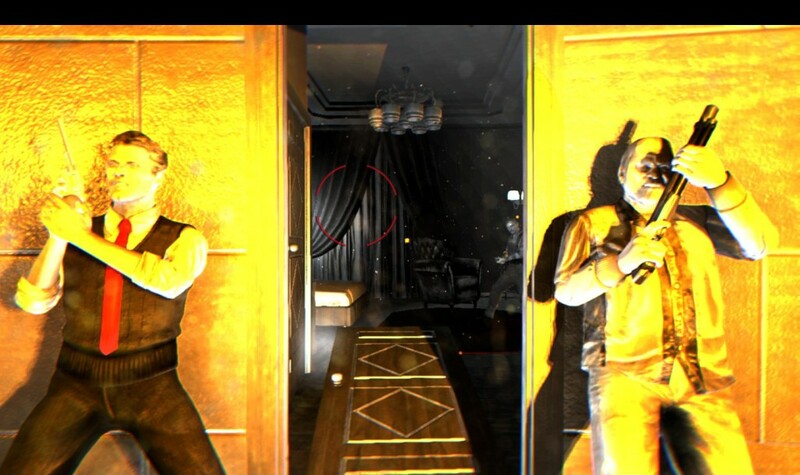 Episodes 1 and 2 follow nearly the same pattern when it comes to investigation and combat, which might suggest that the following episodes will also do the same thing. Overall this is quite fun to see you can expect the same type of gameplay, which will probably set a lot of potential buyers at ease. 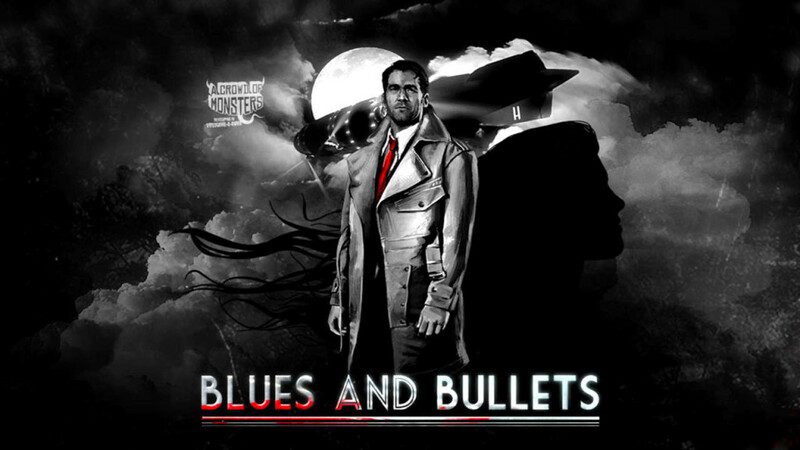 Blues and Bullets, or at least the two first episodes, are certainly worth the effort if you’re into gloomy Film noirs, which combines a great detective story with a small horror undertone. Interesting narrative and an intriguing case are what drives this title and while the mechanics are somewhat on the very simple side, things stay very satisfying throughout the entire experience. Knowing whether you’re truly untouchable, will have to wait until the next three episodes are released.